Editor’s note: This is a guest post from Darryl Kotyk. Darryl runs a cycling lifestyle website called lovingthebike.com. Darryl was originally from Canada but is now based in Austin, Texas. We are very pleased that Darryl has offered to provide his perspective on red lights to The Urban Country readers through this guest post. When the announcement was made in February that Paris, France was going to officially allow cyclists to run red lights, it resulted in a bolt of conversation across the cycling world. This news makes Paris one of the first major cities to allow such a thing, and I have been keeping an eye on it. The experiment in Paris is limited for now and has been introduced in a small district in north Paris. If there is no recorded rise in the number of collisions, the system will be extended to all 69 areas of the capital where there is a 30km/h speed limit. Here in North America the red light laws for cyclists differ from state to state and province to province, but no matter where you are located it is a sensitive (and highly opinionated) subject between drivers and bicyclists. Just as there is a difference in laws applying to red lights, there is also a difference of opinion by cyclists and how they feel. Although we don’t have this same allowance of running red lights as what Paris is testing out, there is definitely no shortage of occurrences where a cyclist rolls on through, or hesitates slightly before going through a red. There is also the issue of turning right on a red light and the laws again differ on this one as well. 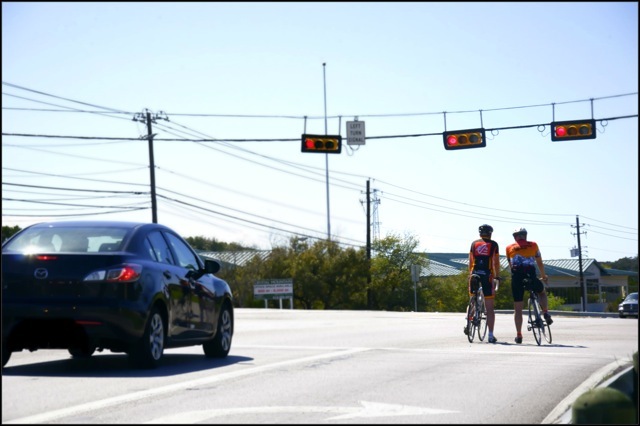 For the purposes of this article I am discussing the overall issue of cyclists and red lights, but for more on right turns on red lights be sure to check out a great article by Tom Meyers: What a Red Light Will Cost You. I think the big question here is why, as cyclists, do some of us feel totally okay with going through a red light when we don’t even think about it while driving a car? This is a tough subject because the viewpoints of rolling through red lights differ from cyclist to cyclist. But it is safe to say that the majority of us fall into one of two opinions: those totally against it, and those who feel it is sort of a “grey” area. I’m a bit of a rule breaking kind of guy, so here is my opinion of the whole thing. If I’m out cycling at 7:00AM on a Sunday morning and I come across a red light and can’t see any civilization (cars or anything else) for miles, then I am definitely not going to sit there and wait for the thing to turn green. Basically, I feel that if someone is being smart, safe, and making an educated decision then it’s all good. This applies to red lights and pretty much all things in life….in my opinion. Many cyclists acknowledge the fact that if they obey the law and rules of the road, then vehicles will respect them. Others feel that it depends on the situation and when traffic is light or non-existent, then slowly rolling through a red is totally fine. There are also those red light controlled by sensors in the road. Many of them are equipped to pick up the metal in a vehicle and will initiate a green light, but there are some where the sensors do not pick up that a bike is there waiting for the light to change. At times like this, a cyclist really has no other option unless they choose to wait for a vehicle to come along to set off the sensor. As pointed out by Marc over at Bicycle Dutch, the Dutch have long been accommodating bicyclists at red lights; not by allowing them to pass through red lights per-say, but by building proper bicycle infrastructure that eliminates even having the urge to pass through a red light in the first place. Without requiring any new laws that pertain to red lights. For more comments from cyclists, view the conversation on our Facebook Page. So what do drivers have to say about this issue? The generally consensus is if cyclists wish to be treated like another vehicle on the road, then they have to follow the same rules and laws that drivers are faced with. Each time a cyclist is seen blowing through a red light, it sets things off and the red-hot battle between driver and bicyclist is further fuelled. It is definitely the case that a cyclist obeying the law pretty much goes un-noticed, but one rule-breaking rider longingly stays in the minds of drivers. Here is my way of putting the idea of a cyclist going through a red light in a way that might be more understandable to a driver of a vehicle. I would liken this to a driver who uses their cell phone while driving in a place where it has been made illegal. It’s illegal, and very un-safe in my opinion, but many people justify their actions and continue to do this each and every day. To drivers like this, they feel that under the circumstances they are not doing anything wrong. It’s the same thing with bicyclists and red lights. In a perfect world, cyclists would have their own roads through proper bike infrastructure. But in reality, we all need to find a way to share the road and keep the peace. Let’s see how this Paris idea turns out and take things from there. Darryl Kotyk runs a cycling lifestyle website called www.lovingthebike.com. At Loving the Bike they believe in living life to the fullest….on and off the Bike, and very much enjoy being a part of the incredible community of cyclists around the world. I think of it like this: if a cyclist runs a red light, and there is nobody around to see it, did he break a law? So, in a real life example, if there are cars at an intersection waiting for the green, I wait too. If there aren’t any cars waiting for the green, and there is no cross traffic, then I’m safe to run the red. In line with what Octavian said, my general philosophy in life is that if I am not harming someone else then I think it’s generally okay to do something. So if there is nobody around, I don’t see the issue with proceeding through a red light. Same goes for talking on cell phones. If you are driving on an empty road with nobody else around, go ahead and talk on your phone. But in reality, there are almost always other people around (other drivers, cyclists, buses, pedestrians, etc. ), so talking on your phone while driving inherently puts other people in danger. 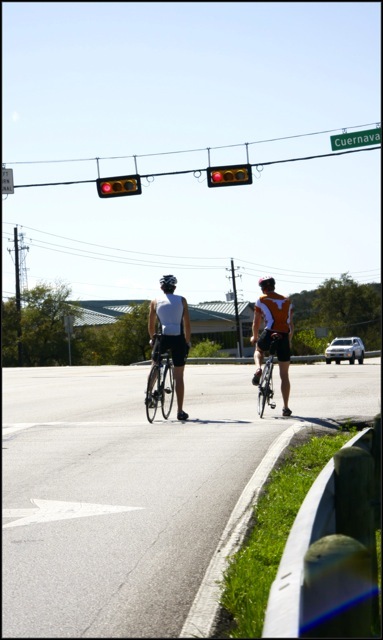 Passing through a red light on a bike generally doesn’t put other people in danger as long as you are doing it safely. In a car, the risk is much higher. If you go through a red light and you didn’t see a small child crossing, you could risk injuring or killing that child. It’s great to be guest posting over here today. As you know, I’m a fan of your site and an even bigger fan of the bicycle lifestyle you live. Keep on being such a great promoter of a bicycle way of life. Awesome. I think there’s something to be said for learning a particular behavior and adhering to it. We do it all of the time where we’re driving— we stop at stop signs (when no one is there)– stop at red lights (when no one is there). Most of us adhere to this because its both the law– and the safe thing to do. While we’re on our bicycle it may be perhaps a bit of an inconvenience, but is there any ride that so important that it can’t wait? This is simply untrue. There is absolutely no reason why downtown Toronto cannot be be like Dutch cities. The downtown would be car-free and the rest of the city would have transportation modes unravelled so that dangerous cars are kept away from people on bikes. Sharing the road with two-tonne lethal weapons is a guarantee that very few people will ride bicycles. Only the brave fearless are willing to do that. I am an avid cyclist. Cyclists who run red lights contribute to the general animosity many drivers feel towards their two wheeled cousins. I don’t blame the drivers. Cyclists are quick to get holier than thou when a driver refuses to share the road, pointing out that bikes are vehicles under the highway traffic act. When it comes to red lights, stop signs, one way streets, illegal turns, and so on, the traffic act suddenly slips their minds. Stop for red lights. It’s only 60 seconds for crying out loud. Edit … I do generally stop for lights on roads where it is necessary. I often take roads that don’t have lots of traffic … on those quiet neighborhood streets, i generally don’t. Then again, check out the multitude of videos of cars rolling through stop signs/lights. we aren’t the only ones that do it, so I’ve never quite understood the controversy. Mark from Holland just did an article about red lights and cyclists. Check it out at his blog: http://bicycledutch.wordpress.com/2012/10/25/cycling-past-red-lights-its-legal-in-the-netherlands/. It shows you all the ways in which the Dutch system allows cyclists to bypass a stoplight in several different situations. It’s not really the same as running a red light, but rather that the lights don’t apply to cyclists to begin with, such as making a right turn at many of the junctions. You’re still expected to obey the lights when they do apply to you, but the timing and prioritizing for cyclists certainly makes the flow much more smooth and quick for them. I’m a bit late here, but I just saw the article. I just have to add that at least in my area, motorists run stop signs way more than cyclists, and if you include right turns and the “That light was a little orange” mentality, they also blow through way more red lights. At stop signs and turning right on red, it is very rare that I see a motorist actually stop when there isn’t an imminent risk of collision if they do not stop. Sometimes they don’t even stop then. For motorists to say they’ll respect cyclists when they follow the laws just like motorists is a contradiction, plain and simple. In addition to this, I regularly have the opposite issue of certain motorists becoming enraged at me when I do come to a complete stop at a stop sign. You can probably guess what that situation is. It is when I happen to be in front of them, and they were hoping not to have to stop for the sign. What it boils down to is that motorists generally don’t care about the law unless someone else is breaking a law and it causes them an inconvenience. I should probably be more general. It is really a human condition that applies to more than motorists, but that is the topic here. – I do not ever see any discussion in the automotive community of whether or not it is acceptable to speed “just a little”, or to come to a complete, 0mph stop before turning right on red, or at a stop sign. In contrast, what we usually read is lengthy screeds about the oppressive horribleness of automated red-light cameras, the evils of license-plate reading technology, and comparisons of various devices for circumventing enforcement technology. – It is widely accepted that “jaywalking” is no big thing if pedestrians look for cross traffic first, and seeing none, proceed. It is utterly acceptable, you see it every day, every where. The only place this topic ever comes up is bicycles. This is Uncle Tom and Stockholm Syndrome, and we should not dignify the tribal jerks with any response other than the verbal equivalent of an extended middle finger. And let-me-tell-you, this “earns respect” argument is experimentally contradicted. I tried obeying the laws scrupulously for about 35 years, and it didn’t do much. I even went so far as to ride after red-light runners to tell them how they were making us all look bad (twice, on a cargo bike, not running lights in the process. It was hard work). In addition, the whole “ride legally, we’ll get respect that way” argument assumes that the people observing us actually know the difference between legal and illegal behavior. Based on my limited and self-selected sample of drivers who feel qualified to lecture me on the finer points of the vehicular code, 100% of drivers don’t know the law. I’ve been trying the control behavior (within reason) for the last few years, and seen no difference. What makes a difference is visibly being a member of the social class our Founding Fathers intended to run the country (white, male, upper class, older), and riding in places and ways that reduce the chance of “surprising” or “delaying” people driving at or beyond their cognitive abilities. I pick wide, straight roads, I use daytime running lights, I ride upright, I use durable tires and wheels, and I practice both line-holding and curb-jumping so that I don’t usually need to take the lane (i.e, I can confidently ride over or around most hazards). I’ve been trying the control behavior (within reason) for the last few years, and seen no difference. What makes a difference is visibly being a member of the social class our Founding Fathers intended to run the country (white, male, upper class, older), and riding in places and ways that reduce the chance of “surprising” or “delaying” people driving at or beyond their cognitive abilities. I pick wide, straight roads, I use daytime running lights, I ride upright, I use durable tires and wheels, and I practice both curb-holding and line-jumping so that I don’t usually need to take the lane (i.e, I can confidently ride over or around most hazards). Idaho has had a rolling stop law for many years. It seems to work well. And there is also a law which allows red lights to be treated as stop signs.